Wednesday 10 September was Hope’s Open Day. We wanted to also make the occasion a chance for us to give thanks to all the people and organisations we work with that make the work we do possible. A big ‘Thank You’ went out to all the agencies we use to signpost our residents as well as the local businesses and charitable trusts that donate to our cause. Some of the highlights included 2 residents undertaking the huge task of cooking and serving delicious lentil curry and apple and sultana cakes for desert – which everyone really enjoyed. We had DJ Bizzy on the decks providing musical entertainment, a bike give away and of course an obligatory raffle – top prize was £100 worth of vouchers for Brittany Ferries! We also had one of our residents give a public speech to all our guests. It was very touching to hear his story. We were recently donated £200 from Abbey Life Assurance Company. This sum of money was used to buy two bikes for two of our residents. We wanted to acknowledge the great achievements some of our residents have recently demonstrated. After much deliberation we decided on two which we felt deserved the bikes the most – but it was very tough on deciding since there were so many deserving candidates. We would love to be able to give away more prizes to many deserving residents!! 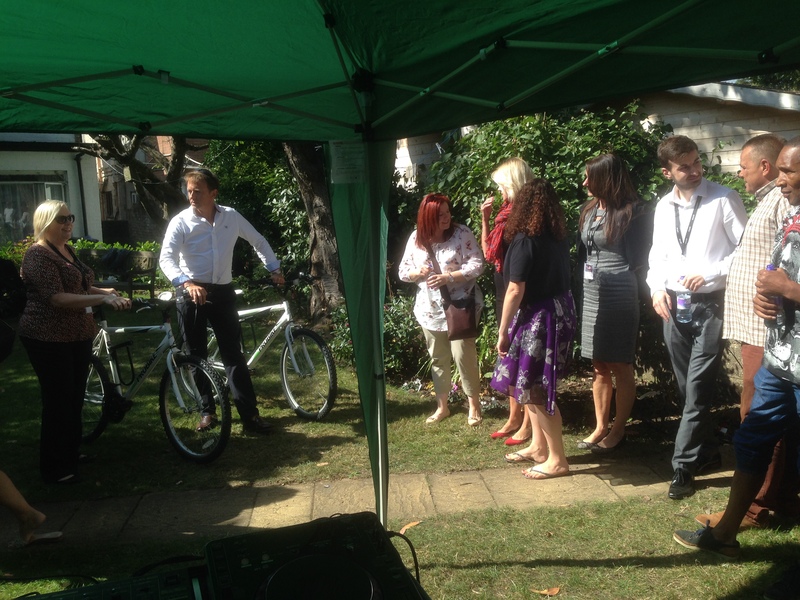 We were thrilled to give away the bikes at our Open Day on September 10. It was a great way to formally congratulate the two residents who were so grateful and proud of themselves. 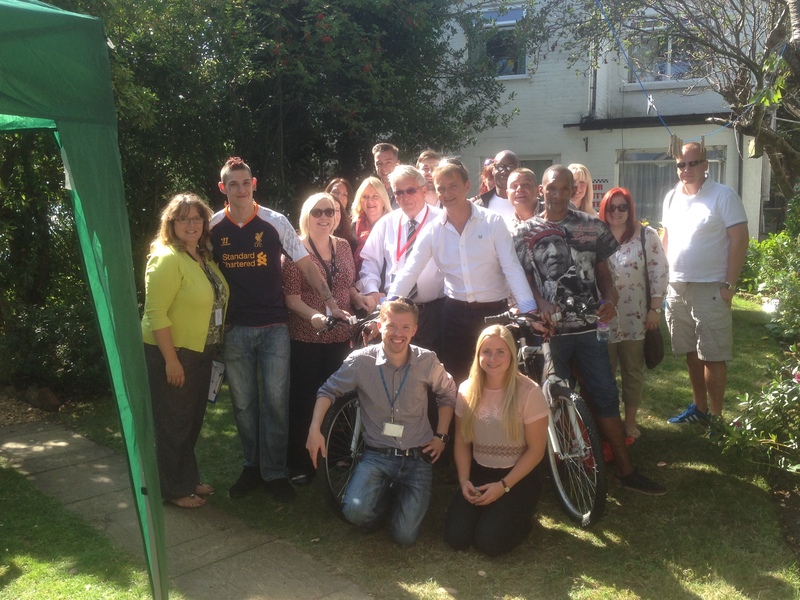 The bikes were presented to the residents by a LOCAL REALITY TV star, Carl Owen, who was in the BBC show ‘Invasion of the Job Snatchers’. Carl then took the two lucky winners for a bike ride from Bournemouth Pier all the way to Poole and back! For full details on the press coverage please click here. Finally we would like to thank ‘On Yer Bike‘ Charminster for donating the bikes, and Ian Govier our Chair Trustee for donating two bicycle repairs kits, should our residents have any mishaps! P&G have kindly paid for the food at our resident’s summer BBQ in August. 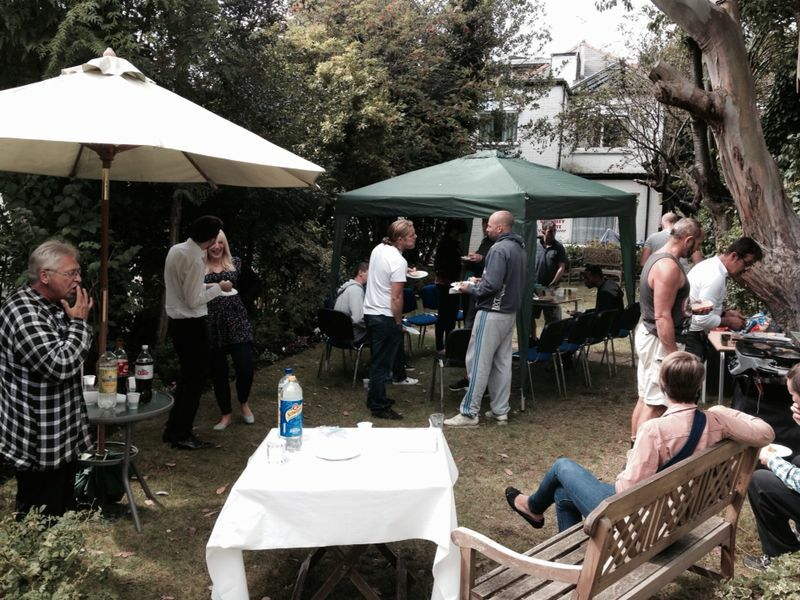 We held the BBQ in the garden of St John’s Lodge and invited all residents from all our properties to come. About 30 residents turned up and enjoyed the lovely atmosphere – not to mention the food too! It really means a lot to us to be able to take the time to enjoy such occasions. It’s nice to enjoy the company of our residents outside the office aside from the usual ‘formal’ advice and guidance service. Thank you once again P&G for making this happen, you have really been a tremendous help to our cause this year!